Bobotie (Afrikaans: [bəˈbuəti] ) is a well-known South African dish consisting of spiced minced meat baked with an egg-based topping. Today, bobotie is much more likely to be made with beef or lamb , although pork lends the dish extra moisture. Early recipes incorporated ginger , marjoram and lemon rind; the introduction of curry powder has simplified the recipe but the basic concept remains the same. Some recipes also call for chopped onions and almonds to be added to the mixture. 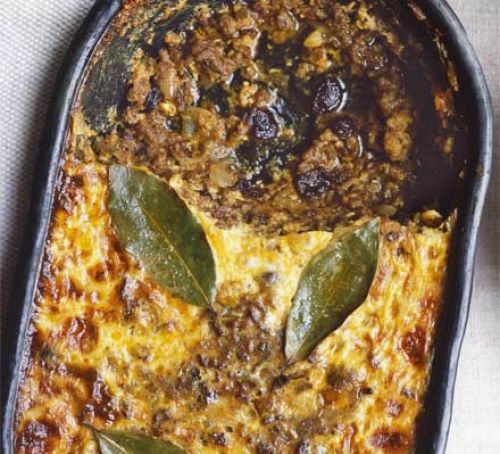 Traditionally, bobotie incorporates dried fruit like raisins or sultanas . It is often garnished with walnuts, chutney and bananas. Although not particularly spicy, the dish incorporates a variety of flavours that can add complexity. For example, the dried fruit (usually apricots and raisins/sultanas) contrasts the curry flavouring. The texture of the dish is also complex, the baked egg mixture topping complementing the milk-soaked bread which adds moisture to the dish. Bobotie is usually served with "yellow rice", which is rice cooked with turmeric.